Powerful 8 channel desktop printer. Durable images on coated & uncoated media up to 630 mm (24”) wide. Easy to use and compact printer. Latest generation piezo print head technology on board. 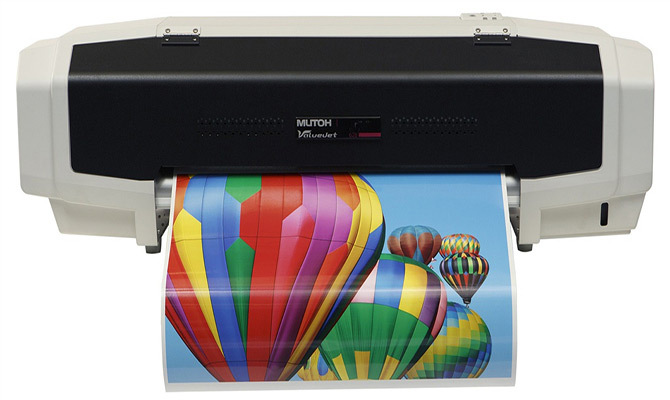 Impeccable print quality every time with Mutoh i² print technology. Print speeds range from 3 to 12.5 m²/h. A revolutionary variable drop piezo print head is at the heart of the VJ-628’s stunning performance. This 1440-nozzle head comprises four colour sections. Each colour section has 360 nozzles, or two 180 nozzle rows per colour. 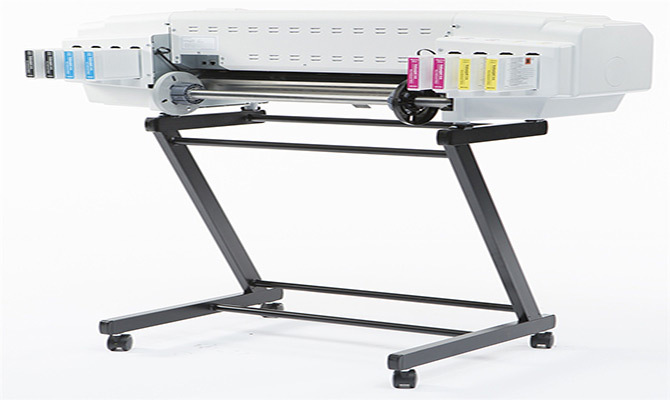 Because all colour sections are united in one head, there is no need for time-consuming head-to-head calibration routines.The print head is capable of producing ink drops ranging from 3.5 pl to 35.2 pl. 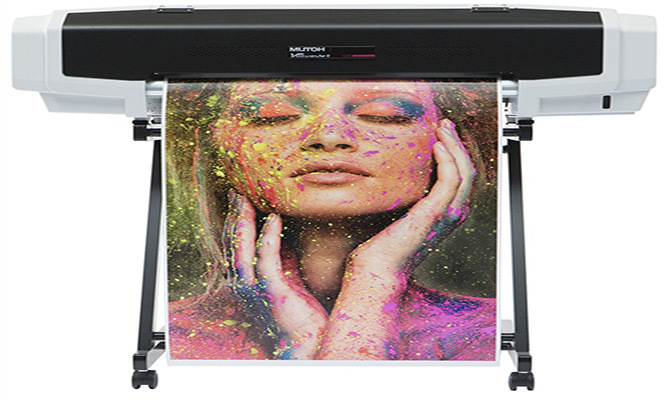 Bottom line, it can produce a wider range of ink dots, which are moreover jetted at a much faster speed compared to other print heads on the market. The result is faster output speeds and moreover a much better print quality at higher output speeds. Mutoh Eco Ultra Inks are by far the most popular inks on the market for outdoor sign applications on a wide range of uncoated and coated substrates. The inks are based on non-aggressive solvents and do not spread any harmful VOCs in the working environment. As a result, there is no need for forced ventilation. Available in easy-to-use cassettes and litre bags, Eco Ultra inks are Mutoh’s third generation of eco inks featuring improved ink fixation, better drying, higher print speeds and improved scratch resistance. Prints made with Eco Ultra inks are water resistant and offer an outdoor UV-resistance for up to three years outdoors*. *:For heavy-duty applications where mechanical stress is involved (floor & vehicle graphics), lamination is required. Stabilisation is required prior to lamination. The ValueJet 628 printer offers you a wide range of print modes and speeds. The overview below lists the most popular ones with which impeccable printing quality can be obtained. Quality – 720x720 dpi: 4.6 m²/h. Production – 720x720 dpi: 9.0 m²/h. Speed Production – 720x720 dpi: 12.5 m²/h. The ValueJet 628 printer incorporates Mutoh’s award-winning Intelligent Interweaving (i²) print technology, enabling a drastic reduction or even total elimination of the typical difficulties inherent to conventional digital inkjet printing, such as horizontal banding, step mismatch banding and the visible effects of missing or misfiring nozzles.One of the biggest benefits of this proprietary Mutoh print technology is that it offers predictable and repeatable output quality, therefore bringing an unprecedented level of peace of mind to the printer operator. ValueJet printer users will be able to print ideal quality images fit for purpose every time, in the shortest possible time. 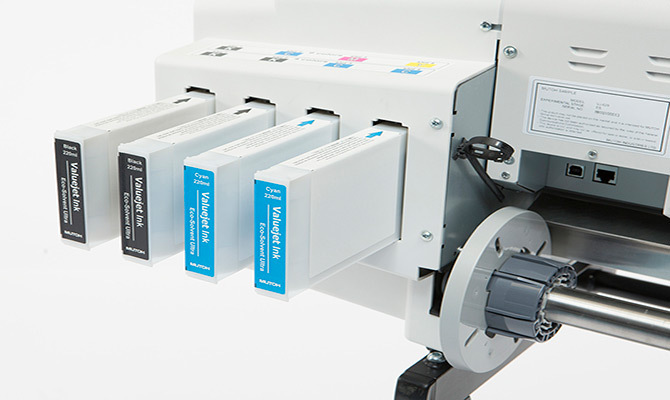 The ValueJet 628 can handle 2” and 3” rolls. The machine incorporates three heater zones. The heating elements will tackle media pre-heating, ink fixation and drying of the prints. 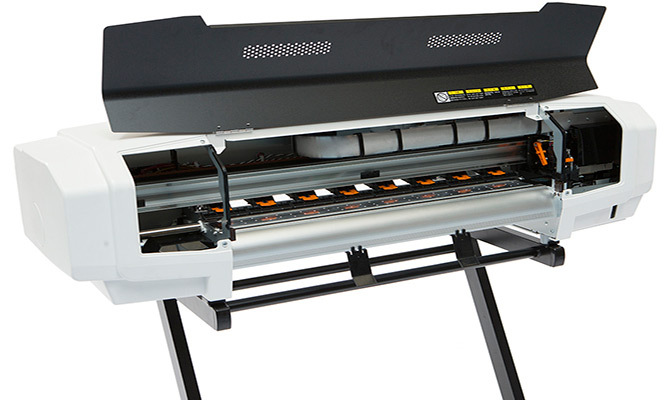 The VJ-628 printer using Eco Ultra ink is ideally suited to deliver top quality images when printing directly onto a wide range of low-cost standard available uncoated PVC, banner and soft-sign materials as well as for coated substrates.The printer comes as a desktop printer with integrated roll holders for media rolls up to 9 kg. Mutoh printer installer & Windows driver. Left & right media retainers + front media guides. i² print technology – offers predictable output quality, therefore bringing an unprecedented level of user comfort to the printer operator. Print and cut simultaneously by running your printer in tandem with a Mutoh multi-purpose ValueCut cutter.The user-friendly ValueCut cutting plotter is ready to tackle all your contour cutting applications such as stickers, short-run decals, window signs and much more.